Hawk Eyes are Mine, At Last! No lotion or face cream. No make-up. No hairspray or mousse. No jewelry. No perfume. 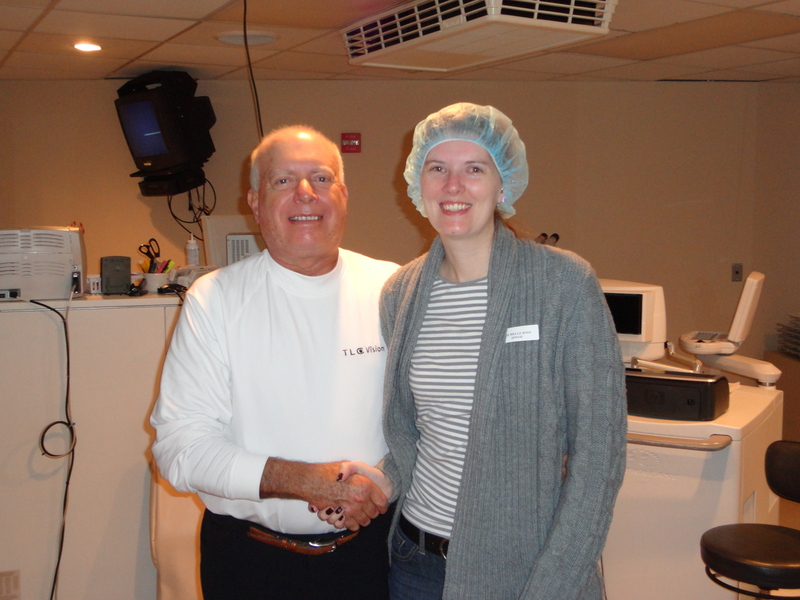 LASIK day started early, with a fresh-faced exit out the door by a little after 6AM. We were in Rockville within the hour. Upon check-in, I had to provide my date of birth and in turn I was given a name tag that was to be prominently displayed at all times. While I sat fidgeting nervously in the waiting room, Thad took the opportunity to check out the snack basket and inspect the mini-fridge for goodies, while at the same time pointing out the appropriateness of the commercial for blinds (as in curtains) that played several times on the TV. Soon enough, it was time to head in. Thad couldn’t come in with me, but instead was at the window to the surgical suite, watching all the juicy goodness as it took place. With little preamble (other than once again stating my date of birth), I laid down on a medical bed and things started happening all around me. My fashionable blue cap doubled as a tissue holder, being stuffed with Kleenex to soak up the massive amount of liquid that was soon to be squirted into my eyes. I spent the next few minutes looking at various green dots with my right eye, trying not to freak out as a speculum was placed around my eye and then attempting to keep my squawks of discomfort to a minimum as the surgeon put a suction cup on my eye and proceeded to cut a flap into the corneal tissue. Several times throughout this procedure the doctor asked if I was breathing. At one point I think I replied with a very polite “No thank you.” Breathing required movement and there was no way I was going to make the slightest twitch while a laser was pointed at my eyeball! As he released the speculum from my right eye, I felt my whole body relax for just a second and I had the chance to fill my lungs with oxygen briefly, until I realized we now go to go through the whole process again, this time on my left eye. Having successfully survived the corneal flap cutting stage, I then stood up and walked/was walked a few feet away to a second bed in the suite. This was where the real sizzling action took place! Starting again with Ol’ Righty, I watched the pretty green, flickering light, as red ones danced around the edges of my vision. During the seventeen seconds of laser-ing, the room filled with a lovely scent that one of the nurses had told me to expect and which she chalked up to the gasses used by the machine, but I am pretty sure it was the scent of my eye being seared by the laser! This laser reshaping of my eye was much less uncomfortable than the flap-cutting portion of the day, so with a bit more breathing, I made it through the fifteen seconds needed to then correct my left eye. Thad met me in the recovery room, where we spent a total of about five minutes. I downed a couple Tylenol PMs, took my goodie bag of eye drops and bedtime eye covers and we were done. Leaving the building, I felt pretty good, but it didn’t take long for the burning to emerge. By the time we got home, my eyes felt like a Thailand sunburn after months of overcast Chengxian skies. Thad filled my eyes with “comfort drops” (I have no idea what was in them, possibly puppy tears, but they were liquid bliss, instantly relieving the burning sensation in my eyes.) With my ridiculously dorky eye covers taped to my face, I gently hit the pillow, only waking to re-“comfort drop” a couple of times, until mid-afternoon. With a reading ban in place, (only once did I try to get away with it, tempted by a catalog that came in the mail, for which Thad promptly reprimanded me) I spent my waking hours watching a marathon of Cops on TV and blinking my way through my assigned regimen of eye drops. Twenty-four hours post-op, I tested at nearly 20/20 vision, with my left eye just a bit behind my right in the healing process. My crazy eye drop schedule will continue for a few more weeks, I have to tape the plastic goggles to my head each night for the next five days and the eye make-up prohibition continues to be in place for another week, which may kill me since I start Chinese classes on Monday (eye shadow, eye liner, mascara, oh my!) but otherwise, I am pretty good to go. No contacts. No saline solution. No glasses. No more four-eyed blindness! The eyes of a hawk have finally become mine. Success! Seriously Target? It is a well-known fact that there is no holiday I like less than Halloween, but still…have you no festive soul? As proud owners of a silver Nissan Sentra for the next twenty-four hours (LASIK transportation), Thad and I decided to use our short-term mobility for such exciting adventures as dinner off the Metro line and a trip to Target that didn’t require crossing our fingers and hoping the bus doesn’t blow right by us. Before we reached those ridiculous aisles, we stumbled upon something even more absurd- Christmas! Stockings to hang by the chimney with care, bells to jingle all the way, Dashers and Dancers and Comets and Vixens. It was all there. The Halloween aisles and the burgeoning Christmas aisles have merged into one large holiday conglomerate. I could easily reach out and grab a pumpkin emblazoned bag of orange and black M&M’s with my left hand and simultaneously choose some adorable sledding penguin wrapping paper with my right. As I pondered the corporate greed that might be blamed for this holiday insanity, I realized that the possibility of a conspiracy exists, but it isn’t on the part of big-business. The immediate jump from Halloween to Christmas really profits one group more than any other- the turkeys! They are more than ugly (yet yummy), wattle-bearing birds- they might just be the brilliant minds behind the skipping of Thanksgiving. Much like the Chick-Fil-A cows and their campaign for us to eat more chicken, the birds have caught on and figure they’ll pull the same stunt by capitalizing on the consumerism of America. Target seems to be happy to comply with this devious plan, as the orange and black and red and green have mixed into a muddy gray of holiday ludicrousness. Like it or not, Halloween is Monday night. Let’s give our slowly sagging jack o’lanterns and spider-web covered bushes their chance to shine in the eerie strobe lights. Santa and his elves can wait in the wings for just one more week before they make their first magical appearance and parents have to begin to explain how Mr. Claus can be at both the mall and the parade a at the same time. Pick a Park- Culture or Amusement? Last weekend, Thad and I decided that this weekend we would take in some of Washington’s cultural magnificence. Not far from the Rosslyn Metro station (which is just a few stops up from us on the blue line) is the footbridge that leads to the Theodore Roosevelt Island National Memorial. We figured with the fall foliage out in full force, it would be a beautiful way to spend an afternoon. But then option #2 came up: Six Flags with John and Erin! Well, there was little debate to be had- if rides are an option, decision making is unnecessary. The weather has definitely cooled off here lately, which created a bit of a conundrum in my mind. I associate amusements parks with broiling summer days, finding a balance between comfortable yet cool clothing and the constant need for gallons of liquid refreshment. Pulling into a parking lot with brightly colored roller coasters on an overcast horizon and getting out of the car while pulling on a hoodie all felt a bit perplexing. When the mercury hits sixty, I don’t normally think of amusement parks, but it turned out to be great, until the sun went down, when it quickly cooled off. It wasn’t the rapidly chilling air that made me ready to call it a day though. With Halloween just a week away, Six Flags is right in the middle of their Fright Night season, which means with the setting of the sun comes the appearance of costumed creatures, many of them wielding chainsaws! I will nervously get on a speeding hunk of metal that shoots me into the air, turns upside down, twirls in corkscrews and then comes to a whiplash inducing, screeching halt, but I can’t handle the costumed creatures. It was time to bid adieu to the park and head home and soothe the frazzled nerves created by perilous rides and creepy creatures. Culture-smulture! Maybe next weekend we’ll make that trip to the Theodore Roosevelt Island Memorial and the lovely dancing leaves of fall! We’ve been together for a little over three decades now. You played nice for the first half of those years, but about the mid-way point you decided that you weren’t going to put the full effort in any more. I am not sure exactly when this choice was made, but it became glaringly obvious when I was in 10th grade and decided to take drivers’ ed. To get my permit for the class, the DMV required that I take a vision test. You failed me in that moment! Apparently, not being able to read the gigantic letters on the first line was a problem for the ever-pleasant women who run the permit department. With your DMV failure, while initially seeming like a huge obstacle to overcome, I did gain one thing- a new fashion accessory. Thanks to you, eyeballs, I spent the next three years of high school rocking a rainbow of colored contacts. Being naturally light blue, I could easily change you up to nearly anything I wanted. I think at one point I had four different contact containers on the bathroom counter, each with a different color of contact inside. While the emerald ones were a stunning jewel-green, by far my favorites were the violet ones. They by no means represented an eye color found anywhere in nature, but, they were amazing! My pasty white skin made an excellent backdrop for those pansy purple contacts. For that, I thank you! The fact that you decided to not work up to your full potential, thereby forcing me into contacts (I have always refused to give in to wearing glasses- you may wish to make my life nerdier, but I have always attempted resistance! ), has, at times, led to some problems. There was the time in Oregon, while on vacation, that I lost a single contact. The trip was a bit of a last minute deal and I hadn’t packed spare contacts. I was miserable as we explored the Rouge River, me with one of you squeezed shut the entire time, totally throwing off my depth perception, causing me to trip over boulders that were closer than they appeared. Or what about the time we got a lovely case of pink-eye from my darling middle school students- do you remember being stuck to the contact like super glue? I woke up in the middle of the night, knowing instantly from the swollen, eye-gunk feel of you that conjunctivitis and I would be taking a sick day together. Since I wore thirty day contacts, that meant prying you open and fishing around until you finally released your eye-booger grip on my contact. That was not one of your more shining moments. So, eyeballs of mine, you may have had the last fifteen years to slack off, and I hope you have enjoyed it, because your couch potato days are coming to an end. Next week you will be forced back to work. A nice little laser, we’ll call him LASIK, is going to come for a visit, to force you back into shape, making you once again work the way you were intended. Your long summer vacation is almost over, so enjoy the next couple of days. A week from now you will no longer be relying on contacts or glasses to do your job for you. No more slacking. No more contact mishaps. No more unglamorous glasses. You, me and LASIK have a date. Be ready, the laser is picking you up at 7:30 in the morning. The quickly creeping up end of October also means Thad’s birthday is just around the corner. Since he is slightly traumatized from his childhood days of birthday gifts wrapped in black and orange and filled with miniature candy bars, I figured I had better not get him anything with cute pumpkins or witches on it. I thought about adorable bat-covered goods, but decided a winged gift of another kind was more in order- tickets to the Eagles/Redskins game. Long a fan of the Philly team, this was the perfect opportunity for him to see them in person with just a jaunt up the blue line. This was not Thad’s first Eagles game (he and Jeremy went to one in Seattle a few years ago, during which Shannon and I opted to partake of the downtown shopping opportunities instead), but it was mine. I have watched countless hours of pigskin frolicking on TV over the years, but this was my first live NFL experience. The game itself was a success. The Eagles had several interceptions and enough points to come out on top as the final seconds of the game ticked away. Although the game was at FedEx field, home of the Washington Redskins (how is this an appropriate mascot?!? ), I was surprised by the large number of Eagles fans in attendance. It was the makings of a massive flock to say the least! Our seats were in a section that was pretty even as far as red and green jerseys, so it seemed like every big play garnered both a standing ovation and a groan of despair. Out of all the experiences at an NFL stadium, I was most astounded by the noise levels! When we watch football on TV, the announcers are always yammering on about the “12th Man” and its impact on the game. I guess I always assumed they were full of bologna and just liked to hear the sound of their own voices, but after sitting through it, I think they may actually know what they are talking about. The Redskins fans sitting directly in front of us were next to a column that had a metal grating around it. The lovely man, whom I nicknamed “Kicky” for obvious reasons, took every possible opportunity to stand up and slam the heck out of that grate with his foot. That poor hunk of metal endured abuse when the defense needed to take a stand, when the offense made a fabulous play or just whenever Kicky felt some pent up rage. There was A LOT of that. The only thing I can compare the stadium noise level to is an experience from a good many years back. When I was in the sixth grade, like all tweens of the time (keeping in mind that this was before the term tween even existed), New Kids on the Block were just about the greatest things going. I skated around the cement roller rink in Nampa innumerable times to catchy tunes like “Hanging Tough” and “The Right Stuff.” NKOTB posters covered the walls of the bedroom I shared with my older sister, Melyssa, and our cassette tape organizers always gave them top billing. The winter of that opening year of middle school, my Aunt Laurie decided to get my sister and I the most coveted gift for girls our age- tickets to the upcoming concert! Not only did she get us tickets, but they were second row, floor seat tickets!!! Melyssa and I couldn’t wait for the day of the concert to come and after an interminable wait, it arrived. We were bundled off to the big city of Boise for our first live concert. After fending off the pleas of middle aged women wanting to buy our seats, we were there, front and center. I remember little of the concert itself, but I do recall that the music was so loud that I could really only hear it by plugging my ears. I think my little sixth grade self lost a bit of hearing that evening! Although it probably wasn’t as bad as my memory recalls it, I remember the noise being excruciating. New Kids on the Block and FedEx Field- more in common than one would imagine! Once the game came to an end, I gladly bid farewell to ol’ Kicky and silently wished him a sore foot in the morning. We made our way back to the Metro and crammed in to a corner of a blue line train for the forty-five minute ride back to Crystal City. Thad’s birthday gift ended up being a success- the Eagles came out with a win and he wasn’t inundated with orange and black covered knick-knacks! As many of you might know, Halloween is my least favorite of all holidays. The aversion actually stems from several different routes, but the two major ones are my utter enmity towards the color orange and a high level of discomfort around costumed things. On the costumed things tangent, let me demonstrate my issues with a short story: A few years ago (okay, it was pre-Peace Corps, so more than just a few) Thad and I took a mini-vacation to Las Vegas with a few friends. Our group included Jeremy and Justin, two of his friends from high school, and Shannon, my best friend and fellow middle school teacher. After wandering the entire length of the Strip, several times, the day was drawing to a close, but there was one Vegas site that was high on a few people’s “Must See” lists- the Star Trek bar. Now, while this was not on a desirable side trip for me, I had hauled the entire group to the Excalibur so that I could get period pictures as a princess! I owed them all an uncomplaining trip to nerd-dom. To be fair, the bar itself was pretty cool. There were all these fancy, futuristic machines that poured drinks and lots of shiny and sparkly cocktail choices. All was going well- for a short time. Soon after we arrived, as Shannon and I sat giggling at the other bar patrons, suddenly a costumed creature appeared in front of us. (I am still unsure if it was male or female.) As I have little Star Trek knowledge (other than trying to emulate Geordi LeForge by wearing my banana clips over my eyes) I didn’t know what character this things was supposed to be, but it was creeping me out. S/he asked questions about where we were from and what we were doing, but all seemed to be aimed directly at me. After giving short, terse answers, I tried to look engrossed on whatever was playing on the TV at the time. The creature walked away, but soon it appeared again. (I later learned that my lovely husband was beckoning it over when I wasn’t looking.) Shannon, being nearly as filled with the heebie-jeebies as I was, agreed to skedaddle with me. We quickly made plans to meet the others outside the hotel when they had finished their sci-fi concoctions and we made our hasty exit. The only problem? Apparently the costumed things are allowed to roam freely! I figured if we got out of the bar itself, we would be safe, but no such luck. Whatever this thing was continued to follow us through the hotel. We had no choice but to beeline it for the closest building exit. While we waited in the hotel’s driveway in Las Vegas’ slightly uncomfortable gazillion degree weather, we came to the conclusion that melting into the pavement like ice cream cones at a state fair was a better option that being tailed by whatever costumed creatures lurked in the comfort of the air conditioning. With our gourd safely back home, it was time to finish getting ready for the carving party. (Yes, the pronoun “our” is correct. Thad and I decided to share one pumpkin. We would split the fun. He would clean the guts out and I would carve. Fair deal!!) I soon finished decorating my spider cake- arachnids from Oreos (!) and got the house picked up and extra chairs hauled in from the patio. John and Erin showed up, right on time, with apple cider, a couple more pumpkins and a carving kit. It was time to get to it! After covering the table with newspapers we had collected from the “free paper” boxes nearby, it carving commenced. Erin, our resident artist, carved an intricate design of bats flying around a sliver of moon, edged with clear marbles for stars. John, after painstakingly cleaning his pumpkin and sorting the seeds, carved his jack o’lantern in about three minutes flat. My effort fell somewhere in between the two with a clownish-faced Halloween friend. Without the terror of costumed creatures lurking about, our evening of carving pumpkins and munching on spider cake made the thought of Halloween just a little easier to swallow. Celebrating pre-Halloween is the future of the holiday for me! And tell you how I spent the weekend in Pennsylvania’s care. Staying at a Sheraton with Wi-Fi but no pool. yo on to the Liberty Bell! To witness history in this famous square.